Vanessa was wonderful!! We liked the pool and hot tubs, and the out door seating area on the porch. Excellent property. We really enjoyed our stay. It is very charming, comfortable and has everything you need. Having a beautiful pool and hot tubs are a plus. We loved the outdoor terrace with eating area and lounge space. The hammock was nice. 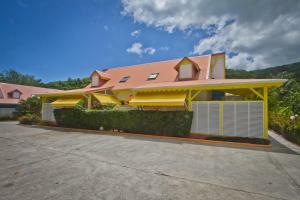 It’s location is ideal, situated near great beaches and spectacular area of Guadelope. Nice grocery store (U-Save) was a short drive. Vanessa, the host, was excellent and had great recommendations. We arrived late in the evening and she left us coffee for the morning and ingredients for a Ti Punch. The kitchen was fully equipped. The onsite pool was beautiful and there were several hot tubs that you could use. The owners take meticulous care of the property. 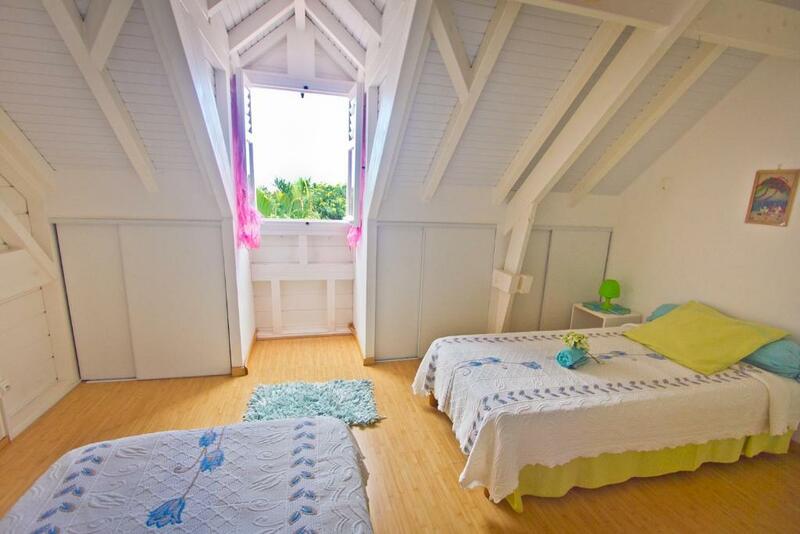 It is clean, the cottages are well laid out for privacy and comfort. The kitchen was spare but had the basics, the bedrooms were comfortable, with air conditioning and nice views from the windows. The entire compound is fenced in--accommodations and parking--so I imagine it would be very nice for families with small children as it is very secure. The pool was very nice, clean and well-maintained, with a play area for children, too. Great hostess upon arrival, location is perfect, grounds are beautiful. Large cabin. 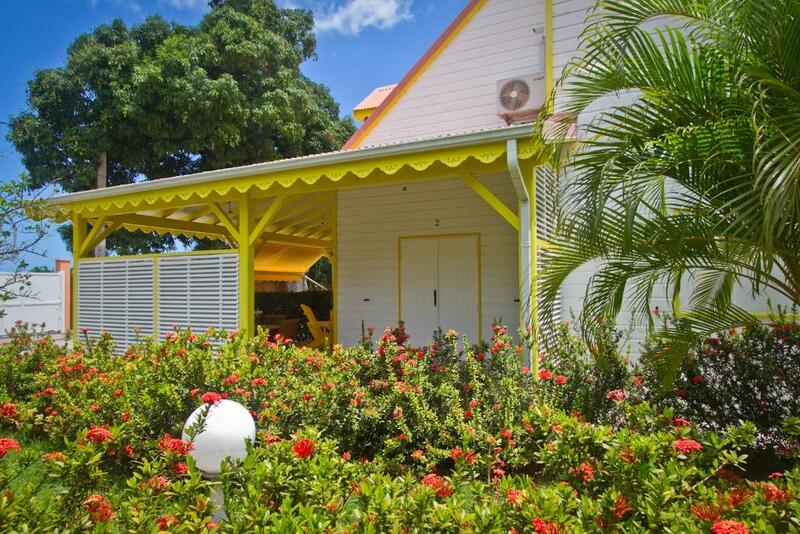 Bungalow is spacious, comfortable, clean, with a dully equiped kitchen and has a nice carribean vibe to it. 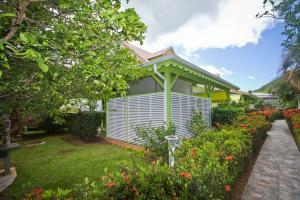 Situated in a well maintained and gated complex of several bungalows. Good location, although car is required. Is close to some amazing beaches (La Perle and Grande Anse). Waterfalls and the Cousteau national park within a 30 min drive. 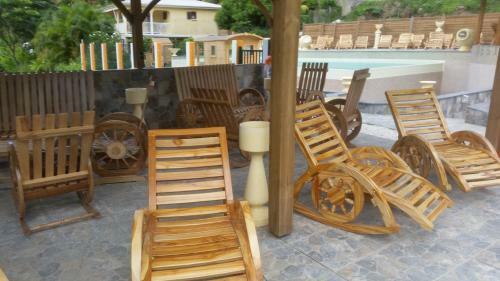 Also great for kids, they loved the swimming pool and the hammocks . Owners are very friendly. We spent 10 days here, and we loved it. Vanessa , first of all, is a very charming and warm person, who gave us friendly welcome and all information we needed. The house in nicely decorated, the rooms are big, bright, clean. There is a big terrace with eating and sitting equipment. There is a beautiful garden with banana trees, different roses, jacuzzi and phantastic swimming pool . The residence in on the northern side of Basse Terre in the vicinity of Saint Rose, just opposite to the Royel Fort hotel. Beaches, restaurants are nearby, you are surrounded with beatiful nature. Huge two floors maisonnette great for a family. All new. Great jacuzzi pool outdoor. Établissement incontournable en Guadeloupe!!! Accueil très sympathique! !l bonne situation géographique, logements confortables et spacieux. Résidence bien entretenue. Jacuzzi et piscine à débordement + barbecue et hamacs top! Hôtes très disponibles . Rhum et café à dispo à l arrivée. Très appréciable. 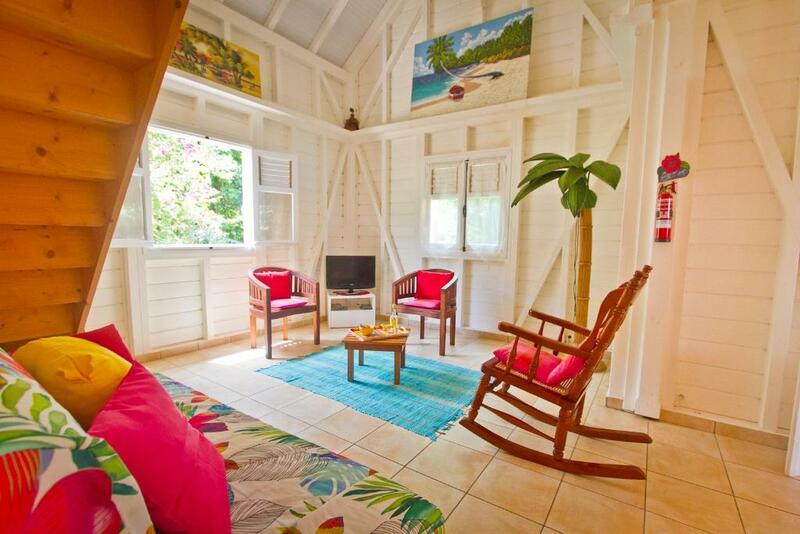 Lock in a great price for Residence Simona – rated 9.3 by recent guests! 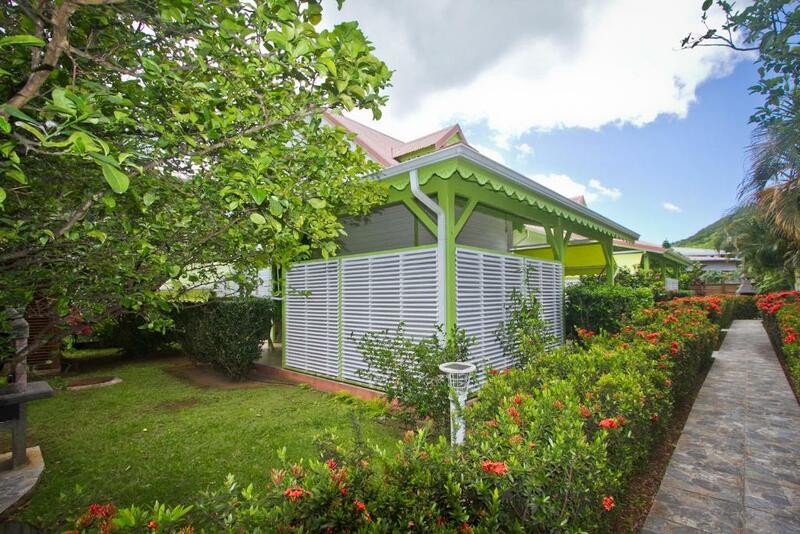 One of our best sellers in Deshaies! Residence Simona is only 5 minutes’ drive away from the beach front and offers free Wi-Fi connection, a large terrace and air conditioning. The property has easy access for the disabled. 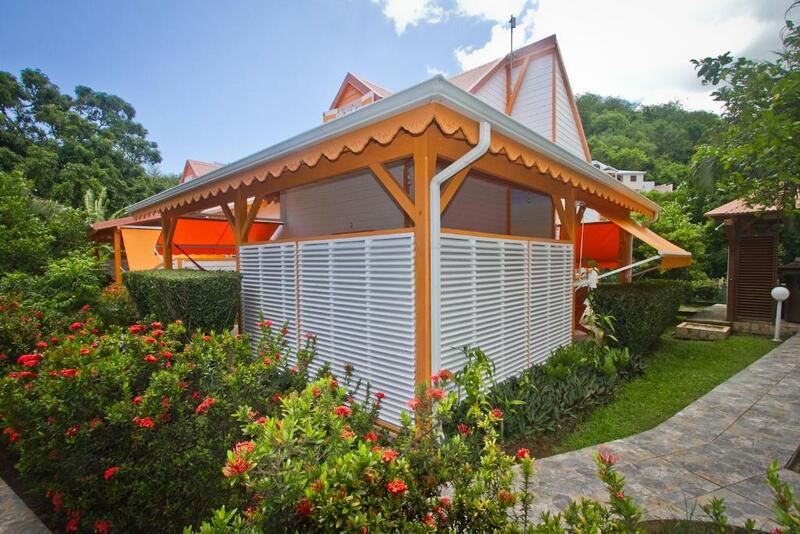 Each accommodations has an equipped kitchen with fridge, oven and microwave. 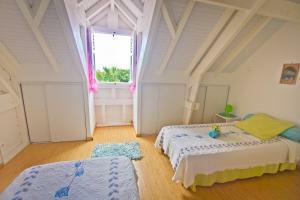 It is also air conditioned, features flat-screen cable TV, dishwasher and washing machine. Guests will be able to find a variety of restaurants within 0.6 mi around the premises. 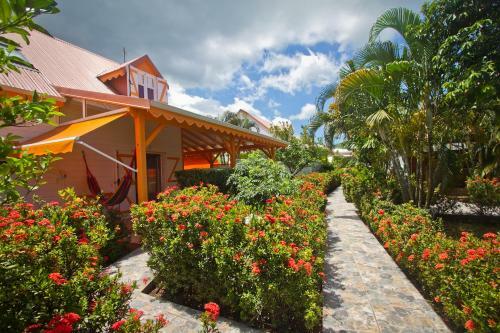 Pearl Beach is 0.6 mi from Residence Simona, while Pointe-à-Pitre International Airport is 40 minutes’ drive away. 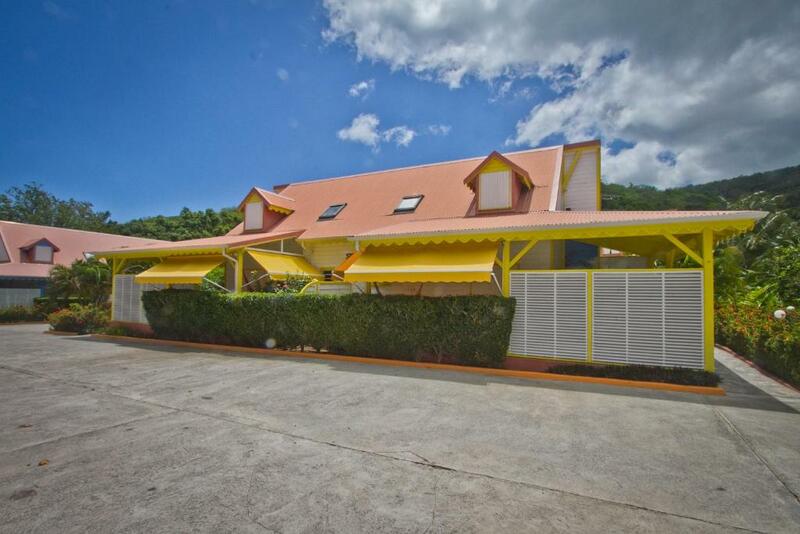 This property is also rated for the best value in Deshaies! Guests are getting more for their money when compared to other properties in this city. When would you like to stay at Residence Simona? The air-conditioned house has 3 bedrooms and 2 full bathrooms. It also has an equipped kitchen with fridge and microwave. A dishwasher and washing machine are available. The linens and towels are included in the room rate. The bathrooms have showers. The house also feature a large terrace. House Rules Residence Simona takes special requests – add in the next step! Residence Simona accepts these cards and reserves the right to temporarily hold an amount prior to arrival. Please note that an additional cleaning fee will be required if the customer does not clean at the end of the stay. 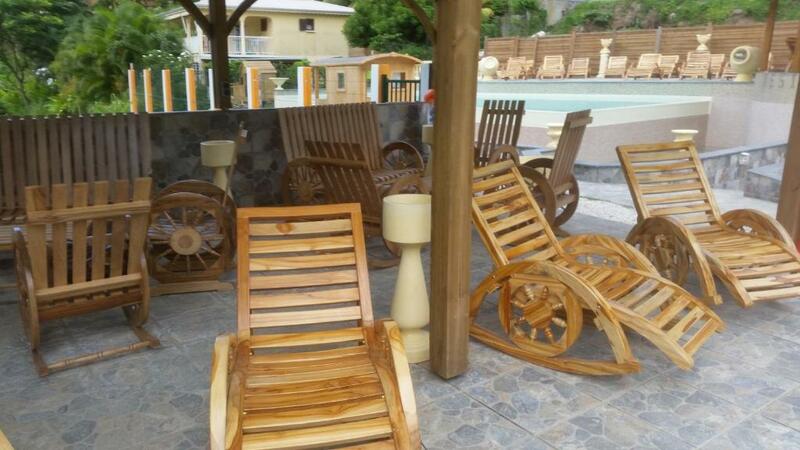 A damage deposit of EUR 400 is required on arrival. That's about 448.10USD. This will be collected by credit card. You should be reimbursed on check-out. Your deposit will be refunded in full by credit card, subject to an inspection of the property. We were next to the work area for the employees which disturbed us a little. The beautiful pool is too deep to stand in at any point There is a childrens pool. Everything was great, but perhaps one suggestion for the gardener: using the leaf blower at 8am in the morning is really too early. Mosquitoes were everywhere inside the home, and we found it difficult to eradicate them. Instead we used repellent to keep them from biting us. Well, the internet service was poor. But we heard there had been a storm shortly before we arrived that knocked it out. And we were on vacation so that encouraged us to get out and enjoy the grounds as well as the beach, a short walk away.